Astroturfing is the practice of pretending to be a genuine person on internet forums, comments sections, and online reviews and posting positive or negative comments about a company while actually being on the payroll of a competitor. As unfortunate as it is, it’s also quite common, which makes it hard to take any comment or online review seriously. Sooner or later though, somebody gets caught doing it, and this time it seems it’s Nubia. The sub-division of ZTE that recently made its way in India is already off to a not so great start. 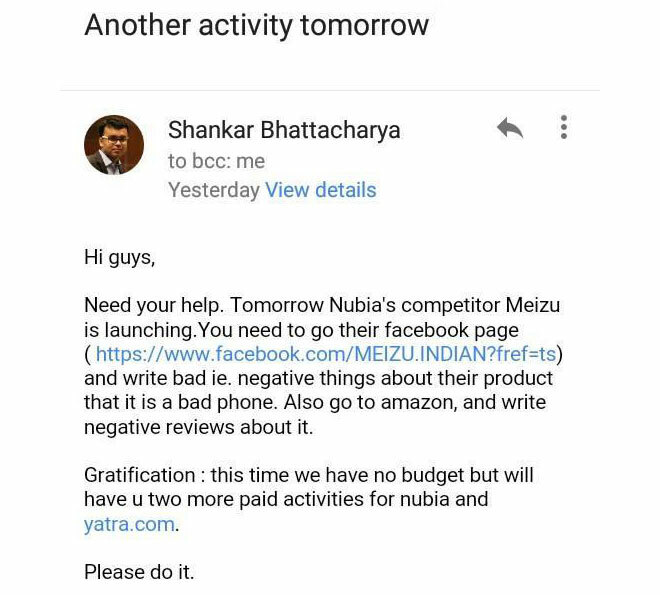 The email you see above is allegedly from a social media influencer apparently working for Nubia PR, requesting others to post negative comments about Meizu, who also recently opened shop in India, on Meizu’s Facebook profile, as well as post negative reviews on the their Amazon page. Both Nubia and Meizu announced their respective products in India during the same week and both are launching exclusively on Amazon India. Both also have their devices in around the same price range so naturally both are feeling the heat right now. It needs to be kept in mind that even though the company name is being dragged into this, the company may not necessarily be aware of this or condoning it. A lot of the times the PR agencies have a mind of their own and do things, ethical or otherwise, that their client may not be aware of. While speaking to the person who tweeted this screenshot we learned the person who sent the email does seem to have a track record of unethical practices in the past. Still, at the end of the day, it’s still comes across as Nubia doing foul play and is bad for Meizu’s business. The company should investigate into the matter and deal with the people responsible for doing this and make sure it doesn’t happen in the future. Having said all that, next time you see an irrationally positive or negative comment or user review about a product, especially when it seems like the person wouldn’t have spent any actual time with the device, take it with a fistful of salt.